When you are out backpacking, it is essential that you get a good night’s rest. If you lose sleep, you will not have the energy you need for hiking the following day. This can literally ruin your trip. Your gear plays a big role in how well you sleep. One of the things that is crucial to you getting sufficient rest is a good sleeping pad. ​Sleeping pads provide you with a comfortable surface to sleep on and also serve as a barrier between you and the ground to prevent all your body heat from escaping. There are many sleeping pads out there so to help you in your search, we have put together a complete buyer’s guide. We will discuss the different types of backpacking sleeping pads, the best backpacking sleeping pads currently on the market, and other information you need to know before making your purchase. 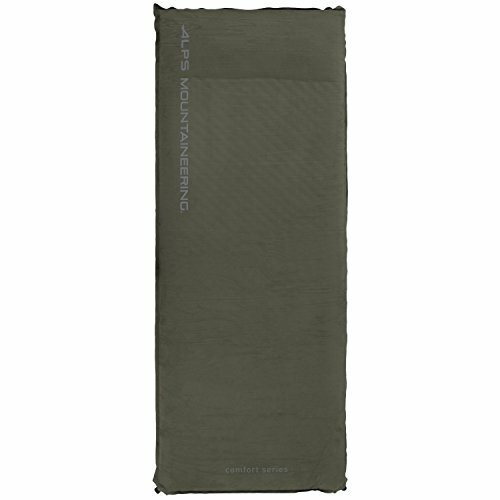 This lightweight sleeping pad is made of durable 75D polyester fabric. The V-shaped chambers are designed to restrict air movement and heat loss, keeping you warm and comfortable. The sides are raised to keep you on the pad if you move around a lot in your sleep. They also aid in insulation. 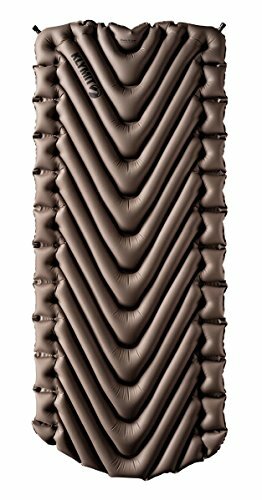 You can inflate this sleeping pad using just 10-15 breaths and you can deflate it quickly by opening the push valve. It rolls up compactly and has a packing size of just 3-inches by 8-inches. ​This self-inflating pad comes in a few different sizes but the “short” size is one of the best for backpacking since it has a smaller packing size and is lightweight. The top fabric is Diamond RipStop, the middle is made of jet stream polyurethane foam, and the bottom fabric is polyester taffeta. Because of this combination of material, this pad is durable and abrasion resistant. The valve is made of durable non-corrosive brass. The anti-slip dots on the bottom of the pad ensure that it doesn’t slide around while you sleep. This pad comes with a patch kit, just in case it gets punctured. If you want a pad that is super comfortable, this ALPS Mountaineering Comfort Series self-inflating pad is the one for you. The jet stream wave foam allows the pad to inflate and deflate quickly. To inflate, simply open the valve and the pad will inflate in 3-minutes. To deflate, open the valve and roll up the pad, pressing out air. Store it away in its included carrying case. The top is a brushed, suede-like fabric which adds to softness and comfort. The bottom has anti-slip dots to prevent the pad from sliding around. This is a great budget-friendly option for a good quality backpacking sleeping pad. It is ultra lightweight and almost indestructible. You can carry it on the outside of your pack without having to worry about it getting ruined. 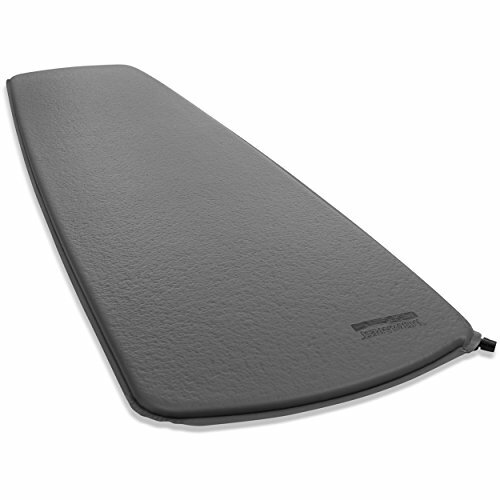 This closed-cell foam sleeping pad is made of cross-linked polyethylene. Featuring patent pending ThermaCapture technology, the surface of the pad reflects radiant heat to your body, keeping you warm. The peak and valley construction provides comfort and traps heat effectively. 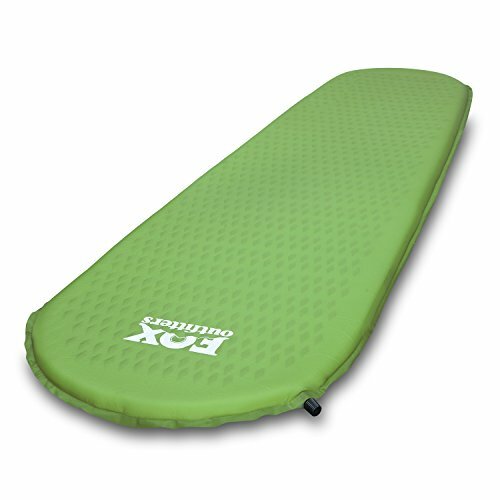 With a budget-friendly price, this sleeping pad is a great 3-season pad for backpackers who have to sleep on snow. With an added layer of insulation, this lightweight air pad is designed for 4-season use and is perfect for use in cold weather. The V-shaped chambers limit air movement and heat loss. They are filled with a synthetic insulation called Klymalite™ to keep you warm on the cold ground. The side rails add for comfort and protection against heat loss. They also prevent you from sliding off the pad if you move around a lot in your sleep. For inflation, you just need to use 10-15 breaths to get the pad completely inflated. The push valve is easy to use and allows for quick inflation and deflation. Included is a patch kit and stuff sack. This pad also comes with a lifetime warranty. The closed-cell foam makes this pad virtually indestructible. The aluminized surface reflects heat back to your body, keeping your warm. The peak and valley design aids in insulation and comfort. The peaks and valleys also nest inside one another other when folded up to decrease packing size. This extra large air pad is great for large people or others who just want an extra comfortable sleeping pad. Featuring body mapping technology, it offers great support and comfort, no matter your sleeping position. Even though this is a larger pad, it has a very compact packing size. 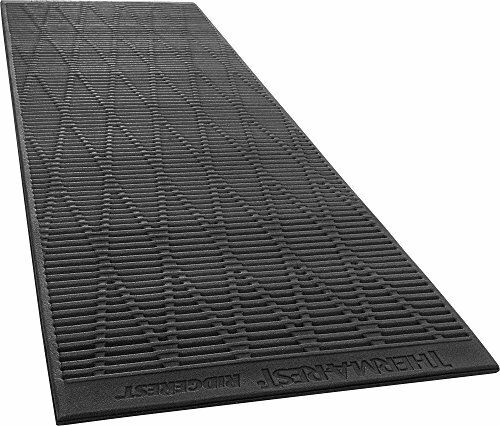 This is an excellent budget friendly, closed-cell foam pad for those looking for a simple option. The peak and valley construction provides comfort and insulation. It is ultralight and very durable. This surprisingly lightweight self-inflating foam pad is great to use in cooler temperatures. The abrasion-resistant bottom fabric is durable and the pad can be used on rugged terrain. The durable, impact-resistant valve allows for rapid inflation and deflation. 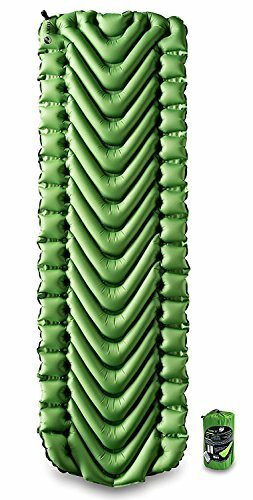 Exceptionally compact, this self-inflating sleeping pad is perfect for backpacking. It is super light and has a compact packing size for easy portability. Your choice of sleeping pad will have a big effect on how well you sleep at night. So before making your choice, there are some features to keep in mind that will help you pick the best one for you. As discussed before, there are essentially 4 types of backpacking sleeping pads: Air pads, self-inflating pads, and closed-cell foam pads. The kind you choose largely depends on your personal preferences. Keep in mind the advantages and disadvantages of each. This is very important when choosing a sleeping pad since a pound here and there can make a huge difference for backpackers. For ultra-light backpacking trips, you will want to go for a closed-cell foam pad since they are the lightest. Keep in mind that they are bulky. Some air pads and self-inflating pads have been especially designed with the backpacker in mind and are lighter. Remember that sacrificing weight usually means sacrificing some warmth and comfort as well. Find the right balance for you. Even a light sleeping pad can be bulky so pay attention to the packing size, such as closed-cell air pads. Although closed-cell foam pads can be carried on the outside of your pack since they are so durable. Most sleeping pads come with a stuff sack for easier carrying. Many sleeping pads come in different sizes: regular, long, or small. The length and width have a large bearing on the weight of the pad. If you are really trying to save on weight, you can get a small size pad. Be sure that it is big enough to at least fit under your shoulders and hips. If you are tall, you can still get a short sleeping pad and use some clothes as a cushion beneath your legs. 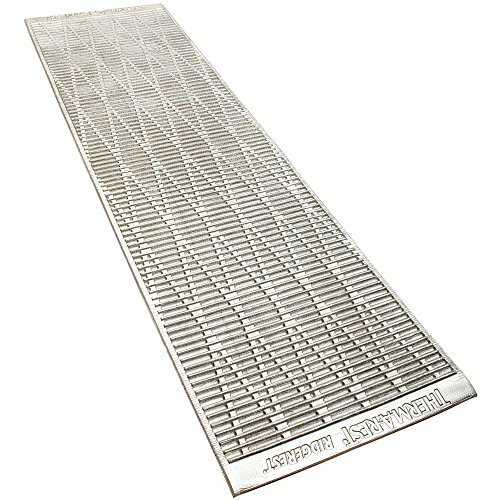 Put simply, the R-value measures how well the sleeping pad resists the flow of heat. The higher the number is, the more insulation it provides. In the summer, your don’t need a sleeping pad with a very high R-value. For winter backpacking, choose a pad with a R-value of 4 or higher. If it is very cold, you can put a closed-cell foam pad underneath an air pad or self-inflating pad for excellent insulation. If you will be backpacking in the summer on soft soil, you don’t need a very thick pad. If you will be sleeping on rocky terrain or snow or ice, be sure to get a thicker pad to provide more insulation. Before making your purchase, you should decide which type you want first. There are 3 basic types. These are great for backpacking since they are lightweight and have a compact packing size. You have to inflate them using your breath or you can use a hand pump. A hand pump is nice to have since it reduces the work for you. Many air pads have been to designed so that they can be inflated with just 10-15 breaths. This is convenient since you will likely be tired after a long day of hiking and not have the energy to use a lot of breath for inflating an air pad. Air pads are usually around 2 inches thick when inflated and provide a great barrier between you and the ground. They insulate your body heat and provide a good cushion so that you don’t feel the bumpy ground underneath. Air pads are very comfortable and you can adjust the firmness by adding or releasing air. Since air pads are subject to punctures, be sure to have a patch kit with you. Many air pads come with a patch kit. This kind of sleeping pad is made of an open-cell foam that is sandwiched between 2 pieces of material. Self-inflating pads are one of the easiest to set up since they require little effort to inflate. To inflate, you just have to open the valve and it inflates on its own as the foam fills with air. They usually take around 3 minutes to inflate fully. The open-cell foam is great at retaining heat and therefore provide excellent insulation, keeping you warmer on chilly nights. ​Self-inflating pads are usually cheaper than air pads but are also bulkier to pack because of the foam. They are also heavier than air pads. Because of this, self-inflating pads aren’t typically used for backpacking but some have been specifically designed with the backpacker in mind. This is one of the more comfortable options and you can adjust the firmness by adding or releasing air. Closed-cell foam pads are made of dense foam with tiny, closed cells of air. Because of this design, they insulate heat very well. Closed-cell pads are a popular choice since they are inexpensive and lightweight. They are also very durable and you can carry them on the outside of your pack without them getting damaged. They are a bit bulky to carry. These are, however, the least comfortable type of sleeping pad since they are usually only about half an inch thick. You will probably feel any bumps in the ground underneath you when using a closed-cell foam pad. Closed-cell foam pads are still a great budget-free option for those who want a light, simple sleeping pad. Choosing the best backpacking sleeping pad can make or break your backpacking trip. Nothing is worse than waking up without sufficient rest with a whole day of hiking ahead of you. To decide which one is best for you, first, decide which type will fit your personal needs. Weigh the advantages and disadvantages of each type. Decide how much weight you can manage. Pay attention to R-values, especially if you will be backpacking in cold weather. ​Once you decide what type you prefer, check through of our top 10 list for the best sleeping pads for backpacking. After going through these steps, you will be closer to your enjoyable backpacking adventure.